I liked Season 1 back in 2014. It's a dark magical girl show where our cute, innocent heroines are being sacrificed to save the world from extradimensional monster hell. It looks lovable and fluffy, but it really isn't. 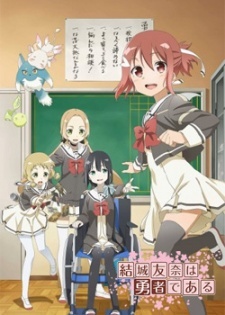 It often gets compared to Puella Magi Madoka Magica, but for my money it's a warmer show. When it wants to be, it's genuinely fun. 7 = Hidamari, a condensed recap of Season 1, which is actually worth watching. You revisit the horror, but now from a Washio Sumi point of view. Motivations get complicated. It's an entire season of passion and tragedy in one episode. 8-13 = Hero Chapter, a sequel with all the characters who've survived so far. They relax. They're happy. They think they've won and that the world is safe. Obviously this doesn't even last one episode. If you're wondering about the right watching order, incidentally, I'd suggest original broadcast order. Season 1 lets its revelations unfold naturally, but you'll be spoiled big-time if you've already watched Washio Sumi. That probably applies even on rewatching, since I don't think you'd want to skip the ep.7 recap or just replace it with a Season 1 rewatch. More importantly, though, is it good? (a) salutes a drawing of the Zuikaku. (b) says, "I'll influence everyone to have national defence ideology through my historical novel." (c) dresses up as "National Defence Mask". (d) says she wants to educate the first years in patriotism and turns their kindergarten play into an exercise in militaristic goose-stepping. (e) gets punished for attempted brainwashing. In the background, though, we also have the Taisha (English meaning: "Amnesty"). They're trying to save the world. Theoretically you can excuse pretty much anything given that, but I reckon they're a bunch of borderline evil incompetents who are presenting their bad decisions as inevitable and yet will be continually changing their minds or fixing stuff when it goes wrong. The Mankai system was pretty horrible in Season 1, but its first-draft version in Washio Sumi is clearly not fit for purpose. It blows up in your face the first time you try to use it. It's like the difference between a nuclear bomb that gives you slow radiation poisoning and one that simply goes off when you look at it. Alternatively, for another example, see what we learn late in Hero ep.2. They're not surprised! They can explain the situation and they're completely on top of it, but they'd have just left her there anyway! We also have the horror of them deciding to try the Mankai system in the first place. It's not in place at the beginning. Then they get prompted into thinking Something Must Be Done, whereupon the details of this horrify even the Taisha's representative herself. This might get a bit much. The ending is pretty out there, but the underlying concept is bold and clear. Watch out for the graveyard of previous heroes, by the way. Yeesh. It's a strong show. The Hero arc could be a bit of a slog occasionally, but I'll probably rewatch the whole saga one day.